Portable, accurate, and highly sensitive devices that sniff out vapors from explosives and other substances could become as commonplace as smoke detectors in public places, thanks to researchers at University of California, Santa Barbara. Researchers at UCSB, led by professors Carl Meinhart of mechanical engineering and Martin Moskovits of chemistry, have designed a detector that uses microfluidic nanotechnology to mimic the biological mechanism behind canine scent receptors. The device is both highly sensitive to trace amounts of certain vapor molecules, and able to tell a specific substance apart from similar molecules. “Dogs are still the gold standard for scent detection of explosives. But like a person, a dog can have a good day or a bad day, get tired or distracted,” said Meinhart. “We have developed a device with the same or better sensitivity as a dog’s nose that feeds into a computer to report exactly what kind of molecule it’s detecting.” The key to their technology, explained Meinhart, is in the merging of principles from mechanical engineering and chemistry in a collaboration made possible by UCSB’s Institute for Collaborative Biotechnologies . Results published this month in Analytical Chemistry show that their device can detect airborne molecules of a chemical called 2,4-dinitrotoluene, the primary vapor emanating from TNT-based explosives. The human nose cannot detect such minute amounts of a substance, but “sniffer” dogs have long been used to track these types of molecules. Their technology is inspired by the biological design and microscale size of the canine olfactory mucus layer, which absorbs and then concentrates airborne molecules. “The device is capable of real-time detection and identification of certain types of molecules at concentrations of 1 ppb or below. Its specificity and sensitivity are unparalleled,” said Dr. Brian Piorek, former mechanical engineering doctoral student in Meinhart’s laboratory and Chief Scientist at Santa Barbara-based SpectraFluidics, Inc . The technology has been patented and exclusively licensed to SpectraFluidics, a company that Piorek co-founded in 2008 with private investors. “Our research project not only brings different disciplines together to develop something new, but it also creates jobs for the local community and hopefully benefits society in general,” commented Meinhart. Packaged on a fingerprint-sized silicon microchip and fabricated at UCSB’s state-of-the-art cleanroom facility, the underlying technology combines free-surface microfluidics and surface-enhanced Raman spectroscopy (SERS) to capture and identify molecules. A microscale channel of liquid absorbs and concentrates the molecules by up to six orders of magnitude. 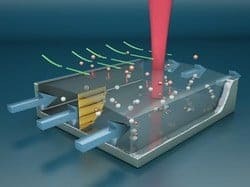 Once the vapor molecules are absorbed into the microchannel, they interact with nanoparticles that amplify their spectral signature when excited by laser light. A computer database of spectral signatures identifies what kind of molecule has been captured. The fundamental research was developed through an interdisciplinary collaboration between Professors Meinhart and Moskovits, and carried out by former doctoral researchers Dr. Piorek and Dr. Seung-Joon Lee. Their project was funded in part by UCSB’s Institute for Collaborative Biotechnologies through the Army Research Office and DARPA. Next articleIs Facebook a Factor in Psychotic Symptoms?